This widget combines live POS feed with the Live Wage Tracker widget, giving you a granular view of your day of operations. You can track exactly how your business is performing throughout the day. No more guessing or trying to do these calculations on the go. 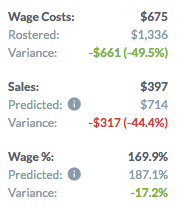 You can use it to make staffing decisions to keep your wage in control, or sales and marketing decisions to increase your sales. Do this on the day, but also learn your trends so you can make changes in the future. If you use one of our supported POS systems (listed below) or send us data via our API, you will be able to see wages, sales, demand, Wage % of Revenue, and Sales Per Labour Hour (SPLH) updated every 15 minutes. To start using Live Insights, set up your revenue streams on the Sales and Revenue page and then assign your data to organisation and/or location on the Datastreams page. The widget is highly customisable, so don’t be afraid to have a play around and figure out how you prefer to view the information. Don't see your POS here? Get in contact.